In one of the previous post, we saw how easily we can Enable Dependency Injection for Web Forms Web Pages and User Controls. In this post we will cover the last topic in the Dependency Injection series i.e. Enabling Dependency injection in ASMX WebServices using Spring.NET. Let's look at each step in a little more detail. ]]> Nothing special about the above piece of configuration. We are informing Spring.NET that its configuration file is located in ~/Config/ directory and its called webservice.xml. We are almost there. All that is left now is to configure the WebService class in the Spring.NET configuration file webservice.xml. Let's say that we want to develop a HelloWorld webservice, that has one method called GreetUser. This method takes in the user name as argument. We will inject the greeting to be used using Spring.NET. Nothing to explain here, all we are doing is prepending the Greeting Property to the userName passed and returning the value as the result. Notice that this HelloWorldService class is a POCO and there is nothing web service specific to it. ]]> Notice that, we are configuring the implementation of WebService with the ID HelloWorldServiceImpl. However, the actual WebService is exposed via Spring.NET. The Spring.Web.Services.WebServiceExporter acts as a proxy over the actual WebService implementation. 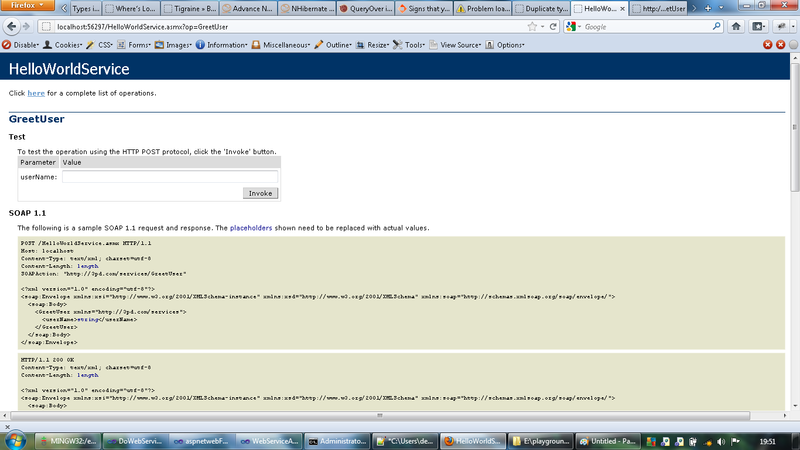 This is the page from which we could invoke the HelloWorldService.GreetUser WebService. ]]> As you can see, the greeting message Good Morning was injected in the HelloWorldServiceImpl class via Spring.NET. 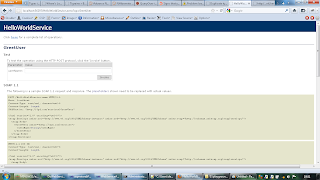 That's all folks, we have successfully Integrated Spring.NET with ASMX WebServices!